The NEC 1091054 DSX wireless headset adapter allows you to connect a Plantronics wireless headset system directly to your DSX telephone’s headset jack. The DSX wireless headset adapter tightly integrates your headset system with the DSX to provide enhanced wireless mobility and call answering. The Plantronics lifter is not required. The 1091054 is compatible with all Plantronics wireless headset systems that use the HL10 handset lifter, including CS55 Series, CS70 Series, Supraplus wireless series, voyager series. 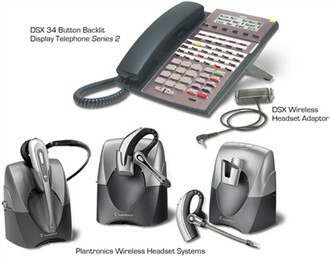 The DSX headset adapter is compatible with NEC 1090021 34-Button Backlit Display Telephone/Black/White – Series 2 or higher, NEC 1090023 Full-Duplex Super Display Telephone/Black/White. The NEC 1091054 has many exciting features for users of all types. You can extend the lifetime of your NEC 1091054 with the purchase of a FactoryOutletStore Factory Protection Plan. The NEC 1091054 is sold as a Brand New Unopened Item.